I bought a Switch. It was a little impulsive. E3 was last week and they announced they are doing a core Pokemon RPG for the Switch. If you are unaware, I’m obsessed with Pokemon. Plushies and figurines litter my room to the point a friend visiting asked where the 12 year old was. I’m the 12 year old. The moment they announced some nebulous Pokemon RPG for the Switch, I was in. I went out, hit up three Targets, and bought one. There are about six games for the Switch. I picked up Zelda. There is a beautiful world with lots of weird things to kill you, and some neat abilities. Zelda is an amazing life lesson. Run up to a goblin thing with a branch, hit it and do no damage, proceed to have it kill you in one shot. See a lake, try to swim across it, die immediately from cold. This is the game. “I want to do this thing!” Die. Still, it’s a beautiful world. Then I picked up Mario Kart 8. 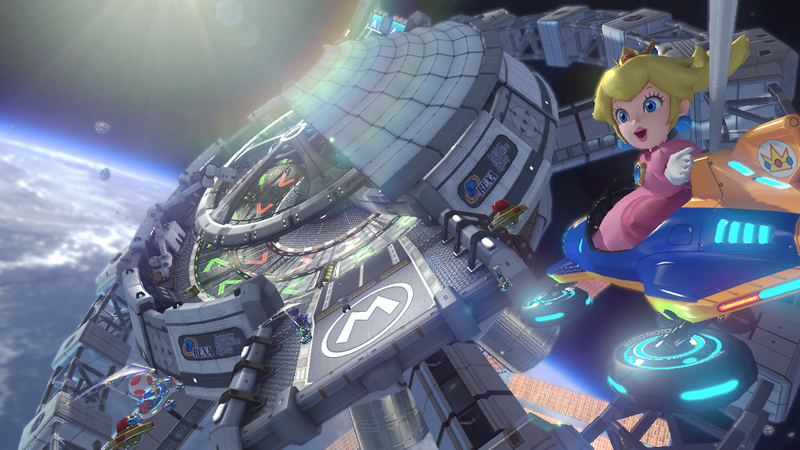 There is no sense in Mario Kart 8. Truly, there never has been, but I haven’t played since college. The lanes wobble either due to psychedelic haunted houses or Bowser punching it. The maps are gorgeous, imaginative, expansive. They tell entire stories, while only taking three minutes to do a few laps on. While the fact you hang glide is cool, you’re hang gliding after driving down a waterfall. To get to the top you drove up a water fall. You drive upside down, sideways, every which way. You’re really not sure where you are in relation to the ground. Every once and a while you want to throw up a little at how the world moves because it’s not supposed to move that way. That’s a space station. There are three Rainbow Roads and each is more ridiculous than the other. It’s incredible. One is over a city, this is in space, and the other I can’t quite remember but it’s an acid trip. Why do I bring this up? Between Mario’s LCD and Zelda’s attempt at becoming Skyrim, my imagination is exploding. I didn’t realize how stagnant it was. I do think NieR: Automata helped a little, but it’s also been putting me into an existential depression. Fantasy and science fiction more and more needs to fit into a neat box. I blame our zeal for science. Everything must make sense. It must have an explanation. Mario Kart doesn’t care about your science. It doesn’t care about gravity. It doesn’t care. It inspired me not to care, and to write a few more imaginative pieces.